"Love the handles made a big potato stew was so good. And katom is awesome also quick reliable prompt"
"would buy again i love lodge"
"the box has a hole, the surface seems not evenly finished. the price is cheap." this is awesome sooo pretty. a little small. "As a retired catering chef, I would like to comment that seasoned cast iron products were the ORIGINAL non-stick pans in the kitchen. They may take another two minutes to maintain every time you use them, but who ever plans to pass down a teflon pan to the next generation? Nobody! These only last 1 to 3 years, whereas cast iron pots & pans can last many decades. Plus cast iron can go from stovetop directly into the oven - teflon usually can't. The even heating of cast iron is un-matched in the culinary world. Lodge products are high quality and reasonably priced. I currently have a small,a medium & a large skillet, 2 "corn bread" trays, a griddle/grill and a 4 quart dutch oven. I use the dutch oven for baking artisan bread and it does a superb job. I plan on buying another tonight, so I can cook 2 loaves at the same time. The lid fits snugly and has a easy to reach handle on the top. Additionally, there are two well-designed handles on opposite sides of the pot, that help you to move around this sturdy pot. Do yourself a favor from the git-go and purchase 2 extra-heavy oven mitts, so you can safely use these pots under all circumstances. These pots DO collect heat and that is one of their great characteristics, so be prepared! If you are looking for lasting satisfaction, not cheap gratification, choose cast iron & choose Lodge! By the way, if you go out to a restaurant and order blackened fish or blackened prime rib, odds are it was cooked in a large cast iron skillet!" "Great for preparation of old fashion "slow cooking" dishes compare to brick oven cooking process." "Performs over and above advertising and expections." "What an excellent product at a great price. 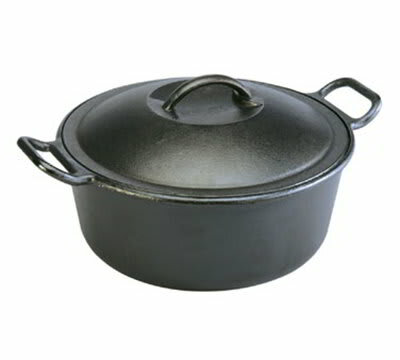 Great for cooking all my cajun dishes, jambalayas and gumbos as well as beans and other soups."